. Tropical rainforests have been called the "jewels of the Earth" and the "world's largest pharmacy", because over one quarter of natural medicines have been discovered within them. It is likely that there may be many millions of species of plants, insects and microorganisms still undiscovered in tropical rainforests. Tropical rainforests are among the most threatened ecosystems globally due to large-scale fragmentation due to human activity. Habitat fragmentation caused by geological processes such as volcanism and climate change occurred in the past, and have been identified as important drivers of speciation. However, fast human driven habitat destruction is suspected to be one of the major causes of species extinction. 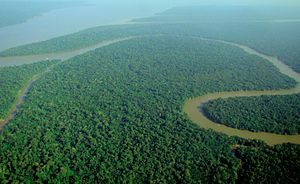 Tropical rain forests have been subjected to heavy logging and agricultural clearance throughout the 20th century, and the area covered by rainforests around the world is rapidly shrinking. Tropical rainforests have existed on Earth for hundreds of millions of years. Most tropical rainforests today are on fragments of the Mesozoic era supercontinent of Gondwana. The separation of the landmass resulted in a great loss of amphibian diversity while at the same time the drier climate spurred the diversification of reptiles. The division left tropical rainforests located in five major regions of the world: tropical America, Africa, Southeast Asia, Madagascar, and New Guinea, with smaller outliers in Australia. However, the specifics of the origin of rainforests remain uncertain due to an incomplete fossil record.